Thank you so much for your hospitality and a fantastic wing walking experience! We had a blast; it's truly something I will remember for the rest of my life!! One of the most satisfying aspects of teaching and flying wing walkers is sharing the moment with a first time wing walker after their first flight. Emotions are high. Wing walking packs a lot of overwhelming sensations into one relatively quick experience. The beauty of the earth seen from a vantage point never seen before, the graceful art of gentle aerobatics in a classic biplane, the roar of the radial engine, the dead calm zero g moment as the airplane slows to a stop at the top a vertical climb, slowly pivoting to point straight back at the earth -you have just completed the hammer head! The roll. Watching the earth seemingly spin around you as the biplane gently rolls, pausing inverted for a moment of zero-g photo op. The loop. The biplane starts a slight dive to build speed. As you reach 140 MPH you instinctively lower your head to allow the blast to bypass your face. As the nose of the big biplane rises to begin the loop the blast starts to diminish and the G's start to increase, as the nose rises towards vertical the g force eases and speed further decreases. The arc continues as you slowly settle and pause at a graceful inverted position. Momentary zero g and another great photo. The nose then drops and speed picks up as we complete the loop. "How to thank a family who gave you one of the best days of your life?" "No words on this site will do the experience justice. Truly Awesome." "We could not have had a better day, the wing walking was mind blowing." 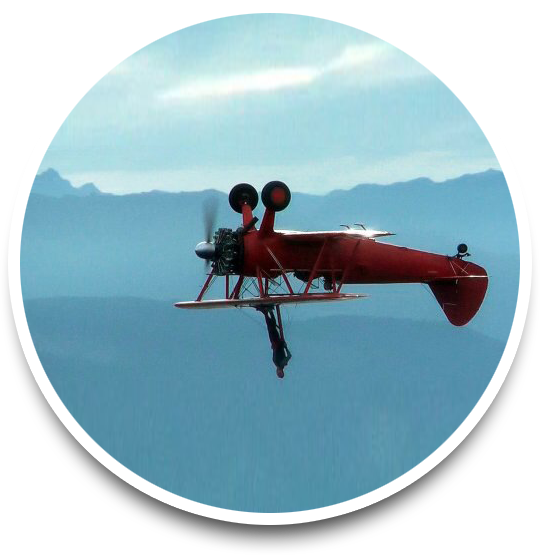 At Mason Wing Walking we train wing walkers on the beautiful Olympic Peninsula. If you have always wanted to wing walk check us out. over 90% of them trained at Mason Wing Walking Academy. involves developing wing walking skills by repetitive climbs from the cockpit to the upper wing rack and along the lower wing. Before we ever start the engine; every step, move, and handhold will be loaded into your muscle memory. Much more than a "thrill ride" we train wing walkers towards a professional level, safety is stressed and fun is assured. $650 One person, introductory course, upper wing. $1800 Two-day course, spread your training over two days and fly twice as much. We are proud to offer our students their first wing walking flight free of charge at the completion of the training course. The tuition fee covers training plus video and pictures. No previous wing walking experience is required. The wing walking is a full day deal, show up first thing in the morning and spend typically 4-5 hours practicing and being coached on climbing around the exterior of the Stearman with a safety harness & cable. When you have that down, we fly! We climb up to around 3500' and power back to a nice slow glide so as to give you a comfortable trek up to the upper wing rack. Once you are secured, we throttle up for a series of aerobatics; loops, rolls and hammerheads. Then we throttle back again and you climb back into the cockpit. While you rest a spell we climb to regain any altitude lost during the aerobatics and glide. Then we repeat the process for the lower wing, lying prone on the "javelin". While you are still on the wing, we wind down the flight with a gentle slow level flight, allowing you to soak in the experience. The average wing walking flight is approximately 25 minutes which includes two sets of aerobatics, one on the upper wing and one on the lower wing. The introductory flight is half as long due to omitting wing walking on the lower wing. The length of each aerobatic wing walking session is largely determined by the stamina of the student. Some students request a longer “straight and level” rest period after an aerobatic session. Wing walking at Mason Wing Walking Academy is a day that can't be matched anywhere. It can't be matched in a $5,000 zero g padded tube airplane ride, and likely would not be matched in a quarter million dollar 5 minute sub-orbital space ride. The truth is that wing walking is not merely an "experience", it is an accomplishment. We invest time in each of our students to make them safe, proficient wing walkers. An important distinction is the difference between a wing walker and a wing rider. Wing riders have no training in moving about an aircraft in flight, they are strapped to the top of an airplane and taken for a ride, never leaving the fixture to which they are attached. For safety reasons we do not offer wing rides. We train wing walkers, an elite group who can competently maneuver about the aircraft. 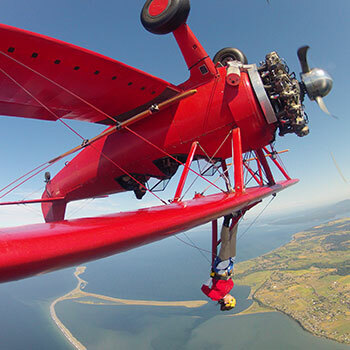 Beautiful Sequim, Washington provides scenic backdrop for a first time wing walk. 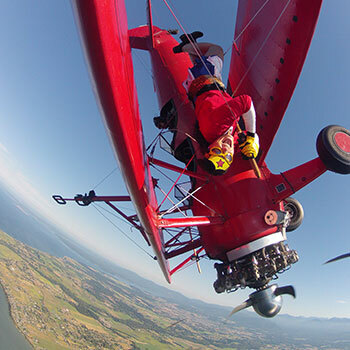 For over a decade Mike and Marilyn Mason’s big red biplane has been a frequent sight performing graceful aerobatics in the Sequim-Dungeness area. Sequim is located on the beautiful Olympic Peninsula. Plan an extra few days to enjoy nearby majestic Olympic National Park. 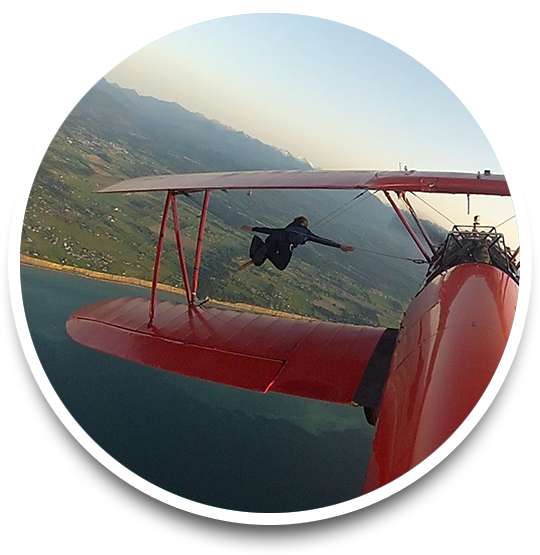 Schedule your training and wing walking adventure today! 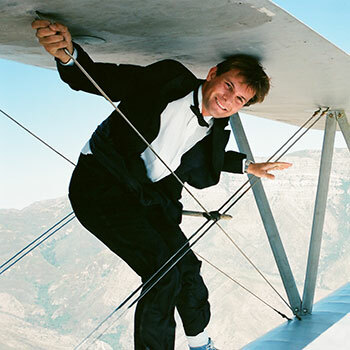 Wing walking with a safety harness and cable is in itself relatively safe. As with many outdoor activities and flying in general there are inherent risks. We take steps to mitigate these risk such as conducting wing walking flights at a safe altitude, use of safety equipment and thorough training. We are not operating in the air show environment so we can operate at higher altitudes which permits much greater safety margins. 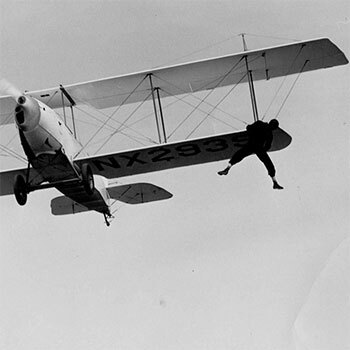 For safety reasons, wing walkers do not use parachutes. If a parachute were to inadvertently deploy while wing walking, the results would likely be disastrous entanglement with the aircraft. But we do use a safety harness and safety cable. We have never had anyone fall. Yes, by training with a friend we can offer substantial discounts. When you enroll with a friend we will discount each student $100. Are there any prerequisites to enrolment? July, August and September are the best months in Sequim. We have had students come from the local Seattle/Vancouver area in the off season by “cherry picking” a good weather weekend. Comfortable, fitted clothing that won't flap in the wind too much. Jeans or shorts are fine, as long as you can move/stretch in them. Bring light layers of clothing, the weather conditions can change quickly here. And narrow shoes, wide-soled running shoes do not work well in the foot holds. Sequim, WA is a long trip from my home, is this offered anywhere else? To the best of our knowledge we are the only wing walking school in the world. There are wing rides available in the U.K.
What is the difference between wing walking and wing riding? Wing walking involves leaving the cockpit and climbing about on the aircraft. Wing riding is being strapped into a fixture on the wing prior to takeoff and remaining there throughout the flight. Why don’t you offer “wing rides”? Safety is a priority for us. 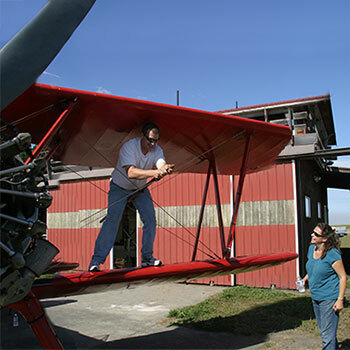 “Wing rides” require take-off and landing the aircraft with a person on the wing. If an engine were to fail at a low altitude, the safest place to be is in your seat with a seat belt fastened. An incident that might otherwise have resulted in little or no injuries would likely result in serious injuries if a forced landing was attempted with a wing walker on the upper wing. Yes, unedited 2.7K video and stills are included. We have two video cameras and one still camera mounted on the airplane. We charge $15 for the 64G 3.0 USB stick for your video and stills. Yes, many people fly two days in a row to reinforce their skills and expand their “boundaries.” Students are always welcome back to conquer new challenges. Might I get air sick? Due to the abundance of fresh air and the gentleness of the aerobatics, we have not had anyone get air sick. Can the pilot and wing walker communicate? Communication is done with hand signals and eye contact. Thumbs up if you are doing well, thumbs down if you are getting tired. Are there any height/weight restrictions? We have not established specific height or weight restrictions, however a certain degree of agility is required. Some have chosen to limit their wing walking to either just the lower or upper wing due to a physical limitation. 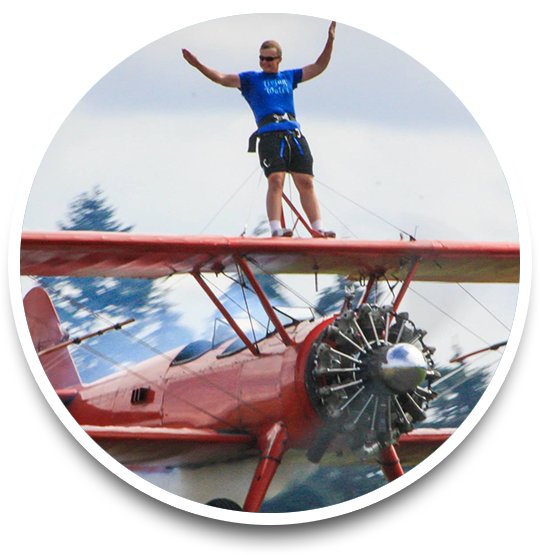 We encourage all interested to review one of our online videos to decide if wing walking is something they feel they can accomplish. Can I find a job as a wing walker? While there is not a large demand for wing walkers, it certainly is a rewarding career to those who pursue it. How do I get to Sequim? If you have flown into the Seattle-Tacoma airport you can rent a car and drive to the downtown Seattle ferry dock to catch the Seattle Bainbridge ferry. You may also take the Edmonds-Kingston ferry or drive around down to Tacoma and cross the Tacoma Narrows Bridge. Any of those choices will take around 2 to 2.5 hours. It is a scenic trip out to the beautiful Olympic Peninsula. Coming from Vancouver Island, take the ferry to Port Angeles and we will pick you up. Coming from the Vancouver B.C. area, ask about a possible pick up at the Point Roberts Airstrip. Mike and Marilyn Mason moved to Sequim, WA 12 years ago from Santa Paula, CA. Their 450 Stearman also came up from Santa Paula and the big red biplane has become a familiar sight in the Sequim/Dungeness area. 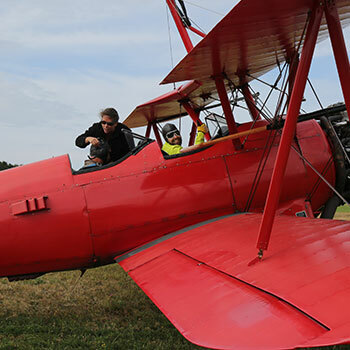 Mike started wing walking and flying Stearmans as a teenager in 1983. Now 10,000 flying hours later he still loves sharing the Stearman experience. 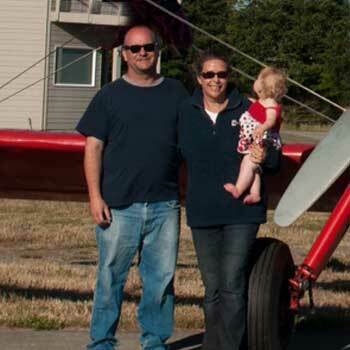 Marilyn enjoys wing walking and preparing others for their first step out. 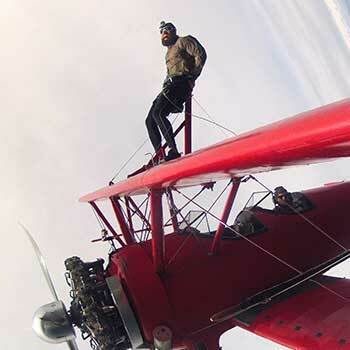 The Mason Wing Walking full day course involves developing wing walking skills by repetitive climbs from the cockpit to the upper wing rack and along the lower wing. Before we ever start the engine; every step, move, and handhold will be loaded into your muscle memory. 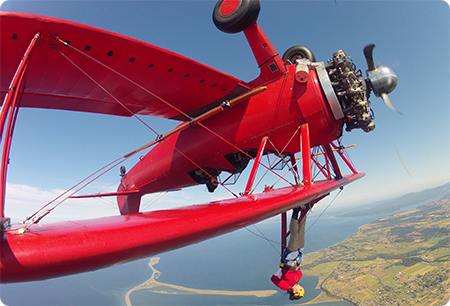 Foremost wing walking instructor Marilyn Mason has a passion for bringing up new wing walkers. These wing walkers join a small elite group who have achieved this accomplishment. The pool of wing walkers (those who actually walk on the wing) in the world is still quite small and over 90% trained with Marilyn. Mason Wing Walking alumni includes athletes, executives, soldiers and grandmothers. Marilyn has prepared Hollywood stunt men and numerous reality show participant/ host for wing walking on camera. A particularly proud moment for her was training the world's youngest wing walker (10 year old). Whether you are a professional football player or soccer mom looking for a challenge, Marilyn is the one to see. Third generation aerobatic pilot/wing walker Mike Mason began wing walking and flying aerobatics in Stearman biplanes over thirty years ago. 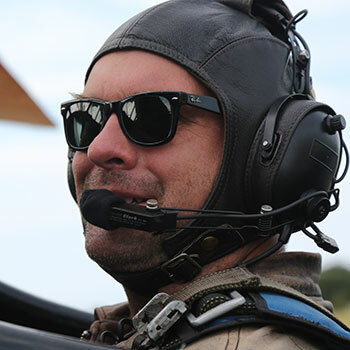 Mike’s day job is flying private jets but his passion is biplanes. Over the years Mike has followed the adventure; sky writing over Japan, bush flying in Alaska, Grand Canyon tour flights, flying cargo planes and worldwide aircraft delivery flights. Mike was taught to fly by his grandfather, air show pilot and Lockheed test pilot, Sammy Mason. Hollywood Hawks traveling air show group, lead by Sammy Mason. As a young “Line Boy” pumping gas at a Los Angeles suburban airport, one airplane Mike routinely fueled was a beautiful red Stearman biplane which stared in many TV and film productions, often pulling up to the pumps with large film cameras mounted on various points. Mike was impressed with this aircraft and its film roles. Little did he know one day he and his wife would own that very same airplane, continuing its tradition of film work and giving it a new task; taking new wing walkers up for their first wing walk! “This was truly a bucket list item!